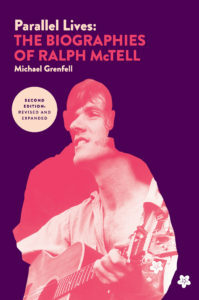 Ralph McTell is the leading singer guitarist of his generation and has built up a formidable catalogue of songs and poems. His reputation is for carefully constructed songs with sensitive lyrics and exquisite melodies. In this book, Michael Grenfell explores the way biography features in Ralph’s work: his own background in London, those who surrounded him in his personal life experiences, his contemporaries, and artistic influences. It also considers the various characters Ralph has invented – Michael in the Garden, Dancing Doreen, Clown, and many others – as a way of getting his message across – and the form that message takes. The chapters are based around Ralph’s work and personal life story, and include extensive extracts from interviews the author has conducted with him. There is also extended coverage of Ralph’s attachment to the poets Dylan Thomas and Sylvia Plath, as well as the influence of the Blues on his musicianship. The discussion is set within the story of the times in which Ralph grew up and the music field, which shaped him. We learn about the way creativity is given birth to and how it is expressed. What emerges in this new expanded, edited and revised edition is a highly engaging account, which ends up examining the impact of music and the arts on their audience, and indeed the nature of biography itself – a fascinating and truly original book of a unique and influential musician.